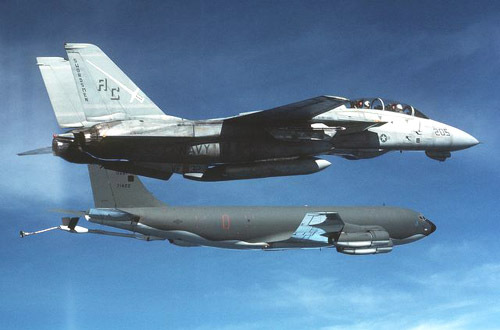 The F-14 Tomcat has the ability to fire the AIM-54 Phoenix -- the longest ranged AAM in the world. The F-14 has visual and all-weather attack capability to deliver Phoenix and Sparrow missiles as well as the M-61 gun and Sidewinder missiles for close in air-to-air combat. The F-14 also has the LANTIRN targeting system that allows delivery of various laser-guided bombs for precision strikes in air-to-ground combat missions. The F-14, equipped with Tactical Air Reconnaissance Pod System (TARPS) is the Navy's only manned tactical reconnaissance platform. The F-14 entered the fleet in 1973, replacing the F-4 Phantom II. The F-14B, introduced in November 1987, incorporated new General Electric F-110 engines. In 1995, an upgrade program was initiated to incorporate new digital avionics and weapon system improvements to strengthen its multi-mission competitive edge. The F-14D, delivered in 1990, was a major upgrade with F-110 engines, new APG-71 radar system, Airborne Self Protection Jammer (ASPJ), Joint Tactical Information Distribution System (JTIDS) and Infrared Search and Track (IRST). Additionally, all F-14 variants were given precision strike capability using the LANTIRN targeting system, night vision compatibility, new defensive countermeasures systems and a new digital flight control system.